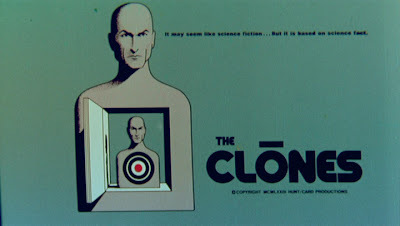 The April 22 installment of The Third Floor Drive-In featured the 1973 sci-fi thriller Clones, preceded by a trailer for the 1979 sci-fi horror film, The Dark. Today I was in a headspace for lo-fi 70's sci-fi, upon thinking about those cheapo Schick Sunn paranormal documentaries that packed 'em in at the drive-in, as well as the discovery that I may finally have found a title belonging to a scene to a tawdry low-budget UFO picture I saw on the late show 25 years ago, and has since made me curious as to what exactly was on the tube that night (the film in question: James Flocker's The Alien Encounters). In the 1970's, public fascination was on high with strange phenomenon, especially UFOs, which prompted countless zero-budget efforts to be made, for a fast buck in exploiting the curiosity of drive-in viewers. And despite how many of these films (the non-documentary ones, I mean) seldom delivered the goods (in terms of suspense, action or decent special effects), I think back on these pictures, and am fascinated to see them again-- perhaps because these films lacked so many frills, they instead were more character-driven, and as a result succeeded more than big-budget Hollywood glossy efforts in exploring that theme of how supernatural phenomenon would truly affect real people. With all this in mind, what could I have possibly chosen for the drive-in that night? Well, The Clones turned out to be an excellent choice. This low-budget effort is perhaps more of a chase thriller with science fiction elements, and as such the scenes which attempt to explain the bizarre plot behind the cloning of these scientists are rather corny, doing a disservice to the otherwise unique feel of the picture. Cinematographer Gary Graver (whose long list of credits is a Christmas wish list of 20 years of drive-in cinema) maintains the paranoid atmosphere with anamorphic lenses, hand-held camerawork and solarized colour. Further adding to the bizarre atmosphere is the casting of John Drew Barrymore, well past his glory days, as a hippie on the road, Angelo Rossitto banging on a telephone booth, and best of all, Stanley Adams (yes, Cyrano Jones from "The Trouble With Tribbles"!) as the villain. Co-directors Lamar Card and Paul Hunt (both of whom have had spotty but interesting careers in the B-movie trenches) have concocted a memorable visceral experience. The Clones is truly is a great discovery. 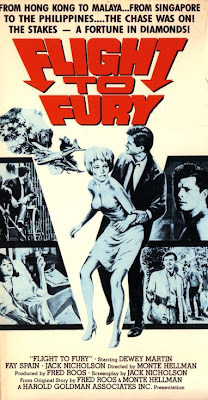 The April 20 edition of The Third Floor Drive-In was the adventure film Flight to Fury, preceded by the trailer for the infamous Mexican film, Survive! I did not realize this, but the next day after screening this film, Jack Nicholson turned 71. And as such, this little gem is a perfect way to honour his birthday, as it features Jack Nicholson during his salad days, when he was still trying to make it as an actor, and was also writing screenplays. As such, The Trip and Head give proof that perhaps the greatest actor of his generation also was an entirely unique writer. One can only imagine what the results would be if he continued writing after his Easy Rider fame. In the mid-1960's, Nicholson collaborated with the quirky genius director Monte Hellman on a pair of existential westerns, Ride the Whirlwind (which Jack also wrote), and The Shooting. Prior to that, they had also teamed up on a back-to-back pair of lesser-known, gritty adventure films shot in the Philippines: Back Door to Hell and tonight's film, the superior Flight to Fury. Any new misfortune is simply a new experience for Wickham to appreciate. His character blurs through the vague narrative, which at best circulates around the McGuffin plot of a bunch of disparate characters who want the diamonds being carried by a passenger pilot. The plane crashes, and the survivors are attacked by unnamed guerrillas, yet these emerge as secondary inconveniences to their lust for loot. At a brisk 74 minutes, this little gem is still tremendous fun, and remains one of my favourite Monte Hellman pictures. The dialogue is snappy, and there are several interesting characters thrown into this oddball adventure. Vic Diaz, a supporting character in countless Filipino-lensed exploitation films of the 70's, is great fun as the Sydney Greenstreet-esque hood Lorgren who also wants the diamonds: while charismatic and good-natured, his character would still betray someone on a whim. While I've always been a fan of this picture, it has an even more special place in my heart after having viewed it at the Third Floor Drive-In. Seeing these characters in their mysteriously unsoiled white polyester suits in the Filipino jungle while I'm hovering at the screen with a coffee and a blanket wondering how they keep cool, made for an interesting juxtaposition. While at heart this is a 1940's matinee film, updated with 1960's edginess, and further made surreal by the locations and tinny old-fashioned music score, it appears as a movie with its own time and space. Seeing this outdoors as the cold wind wreaked havoc, further added to this Zen-like experience. Yes ladies and gentlemen, now that the nice weather has finally reared its head, and that we're no longer surrounded by snowdrifts (with apologies to Saskatchewan), the G-Man wasted no time in opening up The Third Floor Drive-In (founded 2005) for its fourth season, and perhaps the best yet. 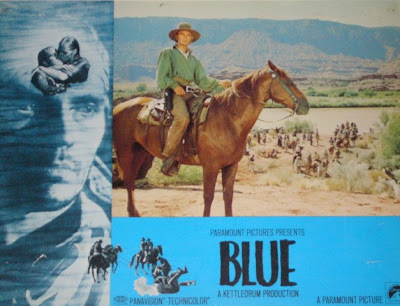 The inaugural 2008 screening on April 19 was... the 1968 western Blue, with Terence Stamp and Karl Malden. Preceded by... trailer for The Stranger and The Gunfighter. Blue baffled most upon its initial release, and perhaps understandably, but 40 years has been rather kind to this bizarre opus. Terence Stamp is the titular character, a gringo also referred to as "Azul" (the Mexican translation) by his surrogate father Ortega (Ricardo Montalban) who is a revolutionary leader. During another of his customary raids on the "Yanquis", Blue shoots one of the bandidos who tries to have his way with the fetching Joanna Pettet. Her father (Karl Malden) is the doctor who nurses him back to health, and much to his chagrin, Blue has rather adopted them as the next surrogate family. And despite the scorn Blue receives from the Yanqui settlers, they realize he is their greatest hope against Ortega's impending revenge. Casting a British actor as a cowboy is a bizarre choice, but this actually compliments the material. Stamp doesn't completely hide his English accent, but however intentionally or not, this, plus his fair skin and bleached hair, adds to his character's displacement from his surroundings. He is a man without a country-- owing much to his American and Mexican heritage, yet similarly being ostracized from both. Stanley Cortez's magnificent cinematography, often filming the characters as specs on landscape, with its saturated colours and wide vistas, further accentuates the otherworldly aspect of the scenario. The music by Manos Hatzidakis, with its thick Greek chords sounding unlike a traditional frontier score, are also evocative of a man from a different world. This oddball film was a critic's joke in 1968 (even more that its director, Silvio Narizzano, had just completed Georgy Girl! ), and while it doesn't always work (for instance, Blue doesn't speak for the first half of the film- a gimmick more contrived than symbolic), it is certainly interesting. There were many "existential cowboys" in the 1960's, perhaps none more than Blue.